CEDAR Audio is proud to announce CEDAR Studio 8, the latest incarnation of the multiple award-winning CEDAR Studio suite of plug-ins, and now more affordable than ever before. Building upon the foundations laid down by CEDAR Studio 7, the new release improves existing capabilities, adds new modules and extends the suite's compatibility with a wider range of plug-in formats. Available immediately, CEDAR Studio 8 is a range of AAX, VST 2, VST 3 and AU plug-ins (as well as a standalone version of Retouch™) and comprises no fewer than eleven advanced processes that allow users to eliminate a wide range of common problems and significantly improve the sound quality of their audio. Each CEDAR Studio 8 process has been derived from our multi-award-winning CEDAR Cambridge™ flagship, and provides unsurpassed results quickly and with the minimum of fuss and user intervention. Including both DNS One™ and DNS Two™, this is perfect for all of your dialogue noise suppression requirements in post and elsewhere. Incorporating no fewer than eight advanced algorithms, CEDAR Studio 8 Restore is ideal for all of your audio restoration needs. The product that changed the face of the audio industry by introducing spectral editing to the world, Retouch™ remains the most effective way to deal with otherwise intractable audio problems. Containing all eleven processes from the three CEDAR Studio 8 packages, CEDAR Studio 8 Complete is the unsurpassed plug-in suite for audio restoration and noise suppression. Please contact your local CEDAR office or dealer for the new, more affordable pricing on each of these. A huge success within the DNS 2™ hardware unit, the newly developed algorithm in DNS Two has already proved to be the quickest, simplest and most effective dialogue noise suppressor ever developed. In almost all cases, using DNS Two is as simple as switching on LEARN and then adjusting the attenuation to obtain the desired amount of noise reduction. If you're working with location sound recordists and studios who already use DNS 2s, the DNS Two process will allow you to replicate their work precisely and fine-tune them for the best possible results. Extended scratches and clicks are encountered on many audio media - film, tape or disc, whether analogue or digital. Manual Declick is ideal for restoring these, and its unique dual algorithms - optimised for long clicks and scratches - will remove noises ranging from those found on optical soundtracks, to drop-outs and extended digital errors. Conventional declicking processes are unsuitable for restoring audio containing extended low-frequency thumps. Dethump eliminates these, replacing the unwanted sound with restored low frequency audio and it’s the ideal tool for removing many of the previously intractable problems associated with optical soundtracks, cylinders, discs, and even modern recordings when, for example, microphones and stands are bumped. A huge step forward from the original CEDAR Declip, you'll be amazed at how effortlessly Declip 2 removes clipped samples and reconstructs the original signal, improving clarity, eliminating distortion, and restoring the original dynamic range of the damaged audio. Unique to Declip 2, our latest algorithm even tracks the clipping amplitude so that material that has been processed with dynamics packages can still be restored. 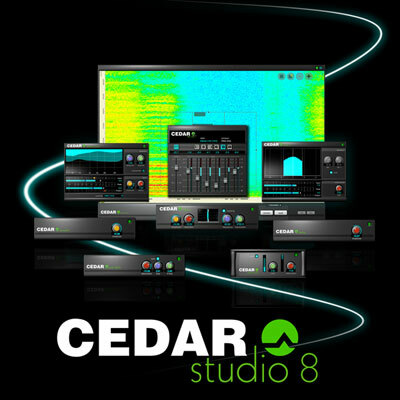 CEDAR Studio 8 is now available. Please contact your local CEDAR office or dealer to arrange for demonstrations. Customers who licensed CEDAR Studio 7 DNS One on or after 1 April 2018 are eligible for a free upgrade to CEDAR Studio 8 DNS. Customers who licensed CEDAR Studio 7 Complete on or after 1 April 2018 are eligible for a free upgrade to CEDAR Studio 8 Complete. Customers with older installations can take advantage of our attractive upgrade prices. Please contact your local CEDAR office or dealer to obtain a quotation.